Pool remodeling is a major construction project and can be a very costly one. So, it’s important to know some key facts about pool remodeling before jumping in with both feet. Before you can cool off during those hot summer days or laze about along the glimmering water, pool remodeling takes a good deal of commitment. It certainly won’t be done overnight. The good news is, after a pool remodeling job has been completed, it will make your inground amenity look entirely new again. And the majority of pools have a limited plaster coating shelf life. But the plaster coating isn’t the only material that can wear to lead to a pool remodeling. There are other elements which can warrant pool remodeling. Pools are endure a lot of stress, which comes in many forms. The weather elements are one thing that can affect a pool, particularly the water quality, as rainwater is harmful to a pool. The basics of pool remodeling are preparation, materials and approach. It’s a good idea to avoid the area during pool remodeling as well as keep pets out of the yard. Children, of course, shouldn’t be allowed anywhere near a pool remodel as dangers abound. It’s a good idea to clear the area of outdoor furniture, pull up and/or cover plants and protect windows with drop cloths or plastic. Sooner or later, no matter how well you maintain your pool, you’ll have to resurface it. While this isn’t a welcome proposition, it certainly is necessary. If you don’t resurface your pool, the damage will certainly worsen and cost much more to repair. Start with the Better Business Bureau when looking for a pool contractor to do your amenity remodel. Check out potential pool remodeling contractors’ licenses with the state. Additionally, references from family, friends, neighbors and co-workers are a good source. Check out past customers to find out their experience. 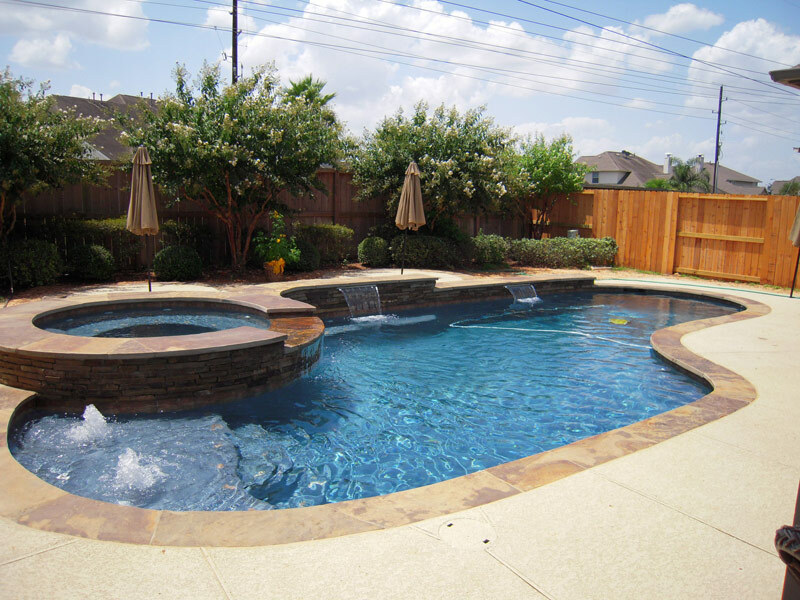 Being licensed, insured and bonded are absolute must-haves for any pool remodeling firm. Narrow down a list of three possibilities, then interview each one. Ask them if they actually do the work or sub it out. Trust your gut and be sure to read and understand the contract before you sign on the dotted line. There are six types of pool remodeling options. Each has its pros and cons. It depends on the area in which you live and the look you are going for. Of course, prices will vary among these pool remodeling options. Pebble Tec. Coming in a wide variety of colors, Pebble Tec is very durable and stain resistant, which means less cost to maintain. It consists of pebbles bonded together with an adhesive. Pebble Sheen. Similar to Pebble Tec, Pebble Sheen is more aesthetic. It has all the qualities of Pebble Tec but also includes a mosaic. The mosaic is a great “centerpiece” in the middle of the pool on its floor. Ultra Poz. An alternative to plaster which is more durable, Ultra Poz is chemical resistant and looks great without going overboard. Tile. Purists who can’t do without tile are among many pool owners. Tile is a great pool remodeling option because there’s no limit to what can be done. Plaster. The most commonly used material in older pools is plaster. And it gets the job done nicely in pool remodeling. Of all the pool remodeling options, this material is the least durable. Water features or decking. The last consideration is taking a pool remodeling job outside the physical structure. Adding a deck and/or water features is one way to put a fresh, functional look on a pool. As with any other home improvement project, pool remodeling can be as extravagant as a homeowner wants it to be. Another good bit of advice is to maintain an open line of communication with your pool remodeling contractor before and during the project. INTERESTED IN SUSTAINABLE LANDSCAPE DESIGN FOR FOR HOME? We’re Sarasota’s premier outdoor landscape design firm, so call The Berryman Design Group at (941) 923-0333 today for pricing information and a FREE QUOTE! No matter the size of the job, we’re meet and exceed all your expectations!! We are a full-service, professional landscape design company and serve all of Sarasota, including near Bayfront Drive, around Rolling Green Golf Club, along Longboat Club Road, and elsewhere.